Enova Team Building in the Community - Enova International, Inc.
It’s common for different teams at Enova to go off-site for team events. At different times throughout the year, we take a break from the hard work and spend time connecting as a team. Clearly, there was a lot of work to be done to make all those meals possible and the UK team was excited to contribute our time to help. On our volunteer day, we helped repack bulk products into individual size packages. Brown rice came in 50-pound bags, which we then turned into 3-pound bags to distribute to the people that needed it the most. 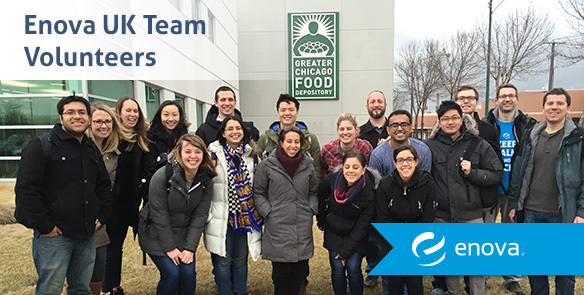 Volunteering at the food bank was time well spent together as a team, but more importantly, a great opportunity to give back to our community and help the hunger relief effort in the city where we work and live. Want to help? The Greater Chicago Food Depository has several ways to get involved. Visit their site to learn more.